Do you have a Dad or family member who loves to camp? 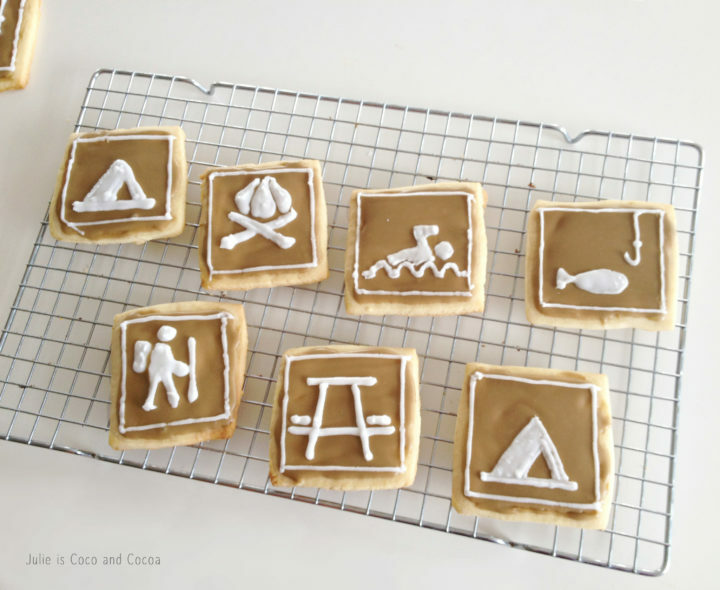 Make them these You Just ‘Camp’ Be Beat Cookies! We are a camping family. Tent camping. We have camped on the beach and in the mountains. We spent a week one summer camping along the Natchez Trace Parkway. I won’t lie, a week in a tent is a long time. That trip we only stayed at each campsite for a night or two and then moved along down the trail. Though my favorite camping trip was the time we went to Big Bend National Park. The landscape was amazing, different from anywhere I had been before. Plus we did a day trip to Marfa where I met America Ferrera. This summer my husband is taking a group of boys for a week-long camping and canoe trip! He recently built a canoe, and while they will take the one they built they will also be renting other canoes so there will be enough room. While I grew up tent camping, it is a little more complicated when you are the adult. Which is why, with quite a bit of camping under our belts, I came up with my list of camping essentials. 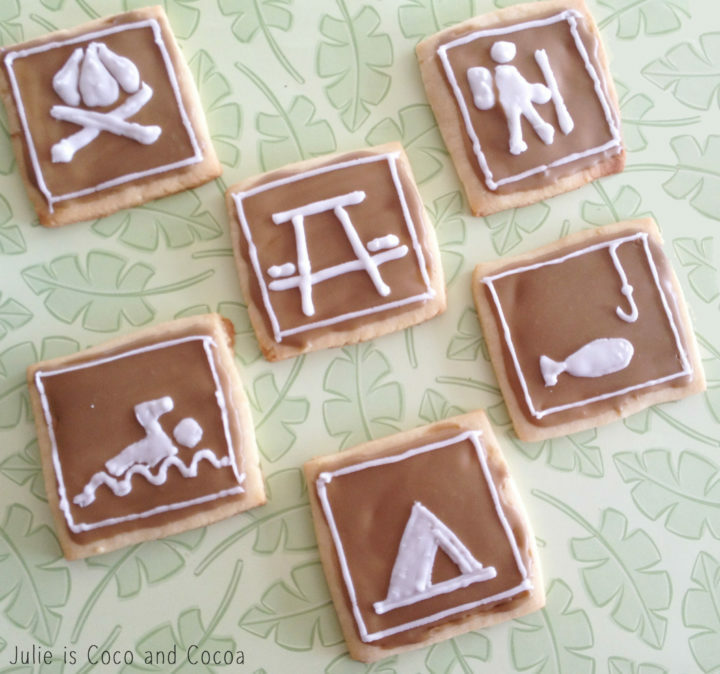 With so much camping going on, it only seemed fitting to make some camping cookies for Father’s Day this year. 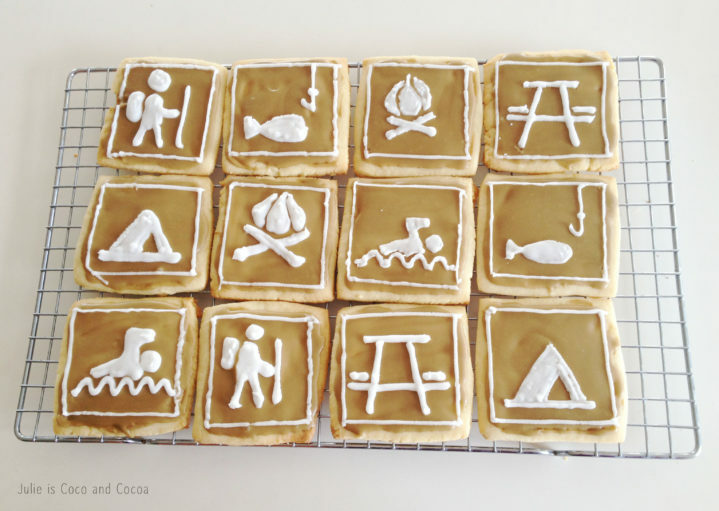 I love puns, and am calling these my camp be beat cookies! 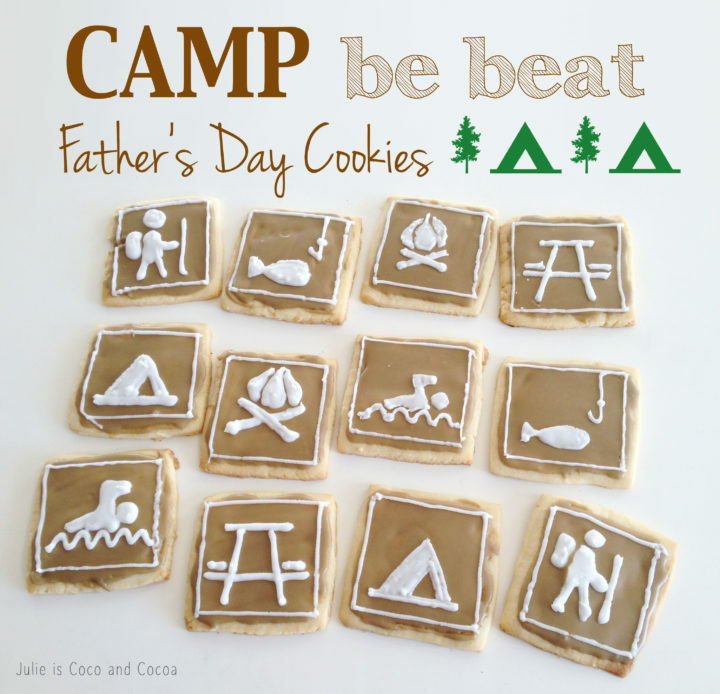 While I am making my camp be beat cookies for Father’s Day, they would also be perfect for any camping related party. These cookies are 3 inch by 3 inch squares. I didn’t have a square cookie cutter so after rolling out the sugar cookie dough I simply used a ruler to measure the size and a knife to cut out the cookies. Now, I do not claim to be a cake/cookie decorator. Which is why these were really pretty simple. I made a batch of pretty thick icing and divided it into two parts. I left half of the frosting white, covered the bowl in plastic wrap, and set it to the side. The other half of the icing I thinned slightly and turned brown with food coloring. Once my icing was ready I iced the cookies with the brown frosting, leaving a slight border at the edges. Let the cookies set a bit before decorating. I put the white frosting into a disposable piping bag and cut a very tiny opening. The designs are all camping related signs. Fire, swimming, fishing, camping, picnic areas, and hiking. I used photos of the camp signs from a national park website to freehand the designs. I also designed a fun printable to go along with the cookies. You can get the free printable HERE. Want more Father’s Day gift idea’s? See my full list of Do-It-Yourself Father’s Day Gift Ideas! Those cookies are so cute!!! Thanks, Holly! I’m not a cookie/cake decorator by any stretch of the imagination, but I was really happy with how they turned out! Those are so cute! I love them. What a great idea. Thanks, Kim! I think these could be fun at a camping themed party, too! Julie – These cookies are adorable! They would be great for a Boy Scout outing, Camp themed party, or just a fun family night camping in the backyard with the kids. Saw them over on the SITS Girls link up. Hi, Sue! Thanks for coming over from the SITS Girls link up! And, yes! I think they could be great for all kinds of summer fun! Julie, these cookies are so creative and adorable! Visiting from i heart nap time and pinning! Thanks for sharing and have a fabulous weekend!